It’s the par five fifteenth at Hazeltine National Golf Club, Minnesota. Ryder Cup day one. Rory Mcilroy has just drained an eagle putt to defeat Dustin Johnson and Matt Kuchar. He bows in mock theatrical fashion to the corwd. Then delivers a mighty fist pump, to let everyone know what the win means to him. It has echoes of Ian Poulter at Medina four years ago. A one-man demonstration of will and courage in adversity. Of course at Medina the European team had the late Severiano Ballesteros’s memory to play for. Here at Hazeltine, there appears to be no external emotional storyline to inspire. When your under the cosh in front of hostile and fiercely partisan American crowds, playing well isnt enough. You have to match the crowd with either an ice cool assassin like mentality. Or dig deep and find a depth of courage and desire that draws on every competitive bone in your body. Anything less simply wont get the job done. It means that the more the home fans want you to miss a putt, the greater your desire becomes to prove them wrong and shut them up. It’s not for the faint hearted, or for tose players that crave affection! 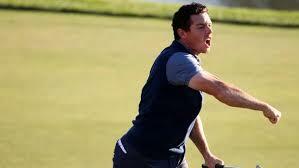 McIlroy’s intensity doesnt just send out a message to the Americans. It sets a tone for his own team. He has just raised the motivational bar and given the Europeans a deeper well of emotional energy and power to draw from. Sport at the highest level isnt just a test of ability. Or your love of winning. It’s also about how much you hate to lose. And Rory McIlroy showed last evening that he has no intention of giving 50,00 Americans the pleasure of seeing him fail!